I am presently sitting at my suite at ITC Sonar in Kolkata and writing this blog, and at 4am in the morning, all I can see from my window is the rains and nature all around – staying in ITC Sonar feels like living away from the busy Kolkata! And the rains, I was missing this in Dubai, so much that I ended up landing in Kolkata during the lovely romantic monsoon. Thanks to Sanjay and his ongoing events, he gave me a suite at ITC, especially the one facing the garden and the in-house lake and I love the view from my room. Prerna, one of my old PR friends from Kolkata is keeping me busy with her invites, and I am gladly accepting them. So, this time it was “Internationally Indian Cookery Workshop by MasterChef Kunal Kapoor organised by Ladies Circle India and Launch of Chanda Zaveri as Brand Ambassador of Ladies Circle India” at ITC Sonar. I got up quite late (at 11am), and again almost slept in the bathtub, only to wake up with a reminding call for the event from a dear journalist friend. So, I jumped in my jeans and came down to the banquet hall. I have to go down my memory-lane to share this embarrassing moment with my blogger friends – it was my first couple of weeks in Dubai, and my flat-mates were mostly from India and Istanbul that time. So, one Friday, after waking up at 2pm (thanks to Thursday night clubbing till 4am), I thought of doing something exciting! I was watching “Bong Connection” – thats what most bongs watch, when they feel home-sick and miss Kolkata! My eyes fell on some cooking videos, and latter I ended up watching a video of MasterChef Kunal Kapoor where he teaches how to cook pasta – Tagliatelle with Mushrooms. I felt all charged up and went to Spinneys in the heat and bought pasta, olive oil, butter, mushrooms, cheese and other ingredients – it left a hole in my pocket, as I had spent almost 100 bucks on all these. The next 2 hours, I better not reveal, coz my flat-mates banned me from entering the kitchen forever, such was my culinary skills! And, latter than afternoon, Ahmad went down to buy band-aid from Aster Pharmacy for me, as I had cut my finger while cooking! I remember last meeting Kunal in Dubai some 3 months back, while we chatted and he told me his whole story, “Sou, when I graduated high-school, somebody suggested a course in hotel management. Coming from a middle-class family, there was pressure to make something of my life and this route offered an escape. I was never fully aware of where I would be heading with hotel management, but I am doing what I love the most.” I can’t agree more with this Punjabi munda. After the book launch, his next logical step is to open his own restaurant. So, I instantly asked him about Dubai and he told me, “Sou, I am working on a concept that will glorify an aspect of Indian cooking that has been underestimated all this while. It will be a bold step, and I love to take on challenges. I dream of bringing this concept to the United Arab Emirates. 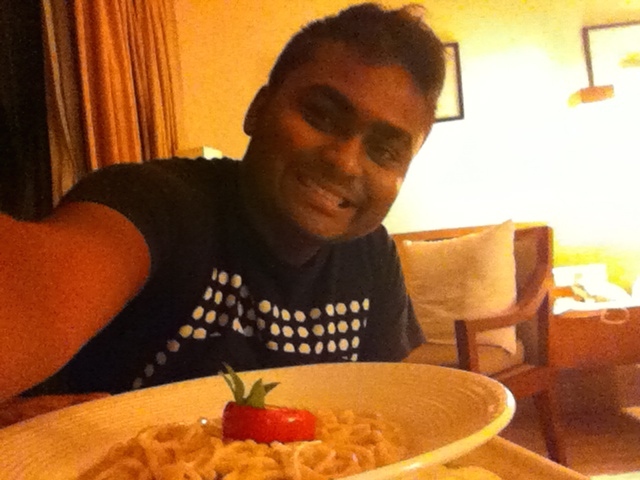 I love Dubai and it is where I want to bring my future restaurant. Eating out in the UAE is like the world coming to dinner.” Having lived in Dubai for sometime now, I completely agree with Kunal. 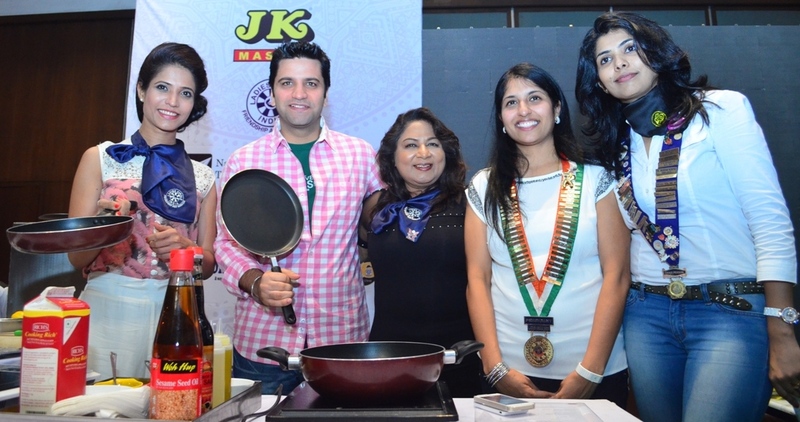 Meeting MasterChef Kunal (Kapoor), with Richa (Sharma), Chanda Zaveri and Smita Murarka at ITC Sonar, Kolkata.